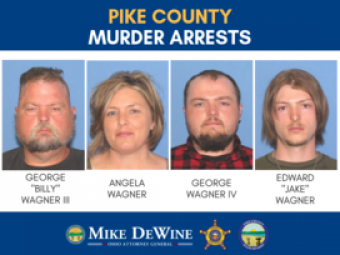 (WAVERLY, Ohio)—Ohio Attorney General Mike DeWine, Pike County Sheriff Charles Reader, and Pike County Prosecutor Rob Junk announced today that a husband, wife, and their two adult sons have been arrested for the murders of eight people in rural Pike County. George "Billy" Wagner III, 47, Angela Wagner, 48, George Wagner IV, 27, and Edward "Jake" Wagner, 26, of South Webster, are each charged with eight counts of aggravated murder with death penalty specifications. We promised the victims' families that the day would come when this case would be solved, and today is that day," said Attorney General DeWine. "The indictments allege that these suspects developed a calculated plan to execute the victims in the middle of the night and then carefully cover their tracks. Their alleged plan was sophisticated, but not sophisticated enough for our team of investigators and prosecutors." Killed were: Christopher Rhoden Sr., 40, his ex-wife Dana Manley Rhoden, 37, and their three children, Hanna May Rhoden, 19, Christopher Rhoden Jr., 16, and Clarence "Frankie" Rhoden, 20. Frankie Rhoden's fiancée, Hannah "Hazel" Gilley, 20, was also killed, along with the elder Christopher Rhoden's brother Kenneth Rhoden, 44, and cousin Gary Rhoden, 38. "This, along with a great deal of other investigative findings, led us to these indictments and arrests today," said Attorney General DeWine. "The Wagners were friends with the Rhodens and had been for years. They knew the layouts of the Rhodens' homes, and they knew the victims' routines. It is our belief that the suspects used this knowledge to meticulously plan these horrendous, cold-blooded murders. " The indictments allege that the suspects purchased ammunition, a magazine clip, brass catcher(s), and a bug detector in preparation for the crimes. They also allegedly obtained and shared information about the physical layouts of the victims' properties, their habits and routines, sleeping locations, and countersurveillance devices present on their properties, including pets. Jake Wagner is also charged with unlawful sexual conduct with a minor for having sexual contact with Hanna May Rhoden when she was 15 years old and he was 20 years old. Jake Wagner is the father of Hanna May Rhoden's older daughter, who was staying with the Wagners on the night the homicides took place. All four suspects are accused of forging custody documents. "We have never stopped working to find the people responsible for these savage crimes, and our sympathies continue to be with the victims' families," said Prosecutor Junk. "There is still a lot of hard work ahead of us, but we will continue to fight to hold these alleged killers accountable." lso arrested today were Angela Wagner's mother, Rita Newcomb, and Billy Wagner's mother, Fredericka Wagner. 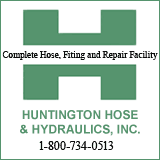 The six arrests are the result of a joint investigation led by the Ohio Attorney General's Bureau of Criminal Investigation (BCI) and the Pike County Sheriff's Office. The cases will be prosecuted by the Pike County Prosecutor's Office and the Ohio Attorney General's Special Prosecutions Section acting as special assistant prosecutors. Several dozen state, local and federal agencies assisted in the investigation, including the Adams County Sheriff's Office, Buckeye State Sheriffs' Association, Butler County Sheriff's Office, Chillicothe Police Department, Clark County Prosecutor's Office, Columbus Division of Police, Delaware County Sheriff's Office, Franklin County Prosecutor's Office, Franklin County Sheriff's Office, Hamilton County Prosecutor's Office, Ohio Air National Guard, Ohio Crisis Response Team, Ohio Department of Rehabilitation and Correction, Ohio Department of Taxation, Ohio Organized Crime Investigations Commission, Ohio State Highway Patrol, Pickaway County Sheriff's Office, Piketon Police Department, Portsmouth Police Department, Ross County Sheriff's Office, Scioto County Prosecutor's Office, Scioto County Sheriff's Office, U.S. 23 Major Crimes Task Force, Warren County Prosecutor's Office, Warren County Sheriff's Office, Waverly Police Department, Bureau of Alcohol, Tobacco, Firearms and Explosives, Customs and Border Patrol, Drug Enforcement Agency, Federal Bureau of Investigation, Homeland Security Investigations, U.S. Attorney's Office for the Southern District of Ohio, and U.S. Postal Inspection Service.